Well summer is winding down here in Clemmons, North Carolina. My children will be back in school less than ten days from now. I’ll have more time to stamp in the mornings. Playing around in the stamp room this afternoon yielded today’s post. Rich Razzleberry is becoming a new favorite. It is great paired with Old Olive. Hope you enjoy. I’ve missed posting the last 10 days. My sons and I have been in Washington visiting my father. We took a couple ferry boat rides into Seattle to enjoy a baseball game, ride to the top of the space needle, Pike Street Market, the Boeing Air museum, and cooled off at the fountain. We’re planning to scrap the photos and share with all of you soon. Be on the lookout. 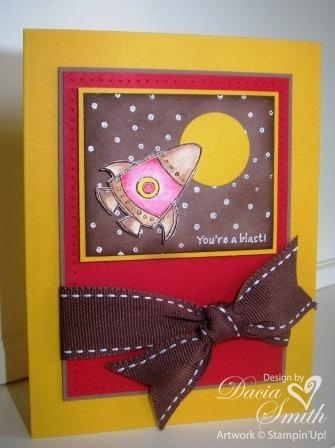 The challenge this week at Late Night Stampers is to case a card from the catalog making it kid friendly in honor of the promotion at Stampin’ Up this month. 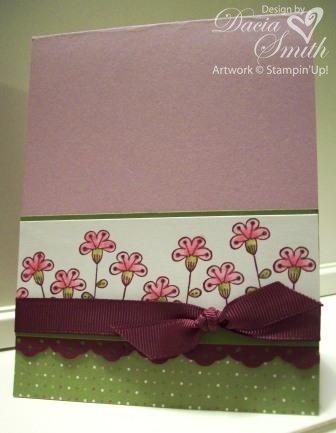 I chose to case the card on page 56 of the catalog. It was lots of fun to make and would be a great boy’s birthday share. If you would like directions email me. Hope you enjoy!